This past February marked the 60th anniversary of a fire which profoundly impacted Lake Hopatcong by destroying its grandest hotel. The story of the Hotel Breslin began during a time when great wooden structures were built in America to satisfy a growing desire for vacations by America’s upper class. The Sagamore Hotel on Lake George, New York was built in 1883, the Grand Hotel on Mackinac Island, Michigan in 1887, the Hotel del Coronado near San Diego, California and the Mohonk Mountain House, New York, both in 1888, and the Hotel Breslin at Lake Hopatcong in 1887. When the Hotel Breslin was built above today’s Edgemere and Windermere avenues it dominated Mount Arlington Passing through the stone gates from Howard Boulevard into “Breslin Park,” guests entered an exclusive, luxurious resort which hosted the rich and famous of the day. In the 1880s, Henry Altenbrand furnished the land for Lake Hopatcong’s grandest development scheme. Altenbrand was one of Mount Arlington’s founding fathers and owned a vast amount of what is now the Borough of Mount Arlington. As a principal in the Lake Hopatcong Land and Improvement Company, the Lake Hopatcong Hotel Company and the Breslin Park Land Company, he joined with a group of wealthy and influential individuals who envisioned an elegant and exclusive resort and community at the lake. They convinced respected New York City hotelier James Breslin to join the group, giving substance to the largest part of the plan, a grand hotel to be built on a hill overlooking the lake. Meanwhile, lots circling the hotel were sold to many of its investors. Families such as the Altenbrands, Pottiers, Dunlaps, and Frothinghams built “cottages” around the hotel site, so that they would be able to take advantage of all of the amenities the hotel offered. Robert Dunlap’s neighbor in New York City, famed 19th century actress Lotta Crabtree, also became a resident of this summer community known as Breslin Park. Ground was broken on 18 acres overlooking Chestnut Point in spring 1886, and the Hotel Breslin opened the following summer. Designed by renowned Philadelphia architect Frank Furness, who also designed Crabtree’s house next door, the hotel featured broad verandas, beautifully landscaped grounds, and a spectacular view of the lake and surrounding hills. The hotel consisted of four floors and approximately 100 rooms. It was more luxurious than any other in the area, and was the first building at the lake to have electricity. Amenities for guests included golf, tennis, bowling, and many other activities. In 1894, construction of a new wing enlarged the hotel to nearly 200 rooms, expanded the dining room, and added a ladies’ billiard room. While a room at the Breslin cost at least double that of most other hotels at Lake Hopatcong (some $20 per person per week for room and meals), there were those who felt it was not “exclusive” enough. This led to the hotel’s conversion into the private Lake Hopatcong Club in the fall of 1896. The prospectus stated that each member would be “individually responsible for the character of the guests booked on his cards, objectionable people will naturally be excluded, and the club will thereby become a most attractive resort for families who will give a distinctly high social character to the place.” Officers of the new club included political and business leaders in New York and New Jersey including Garrett Hobart, who became vice-president of the United State in 1897. 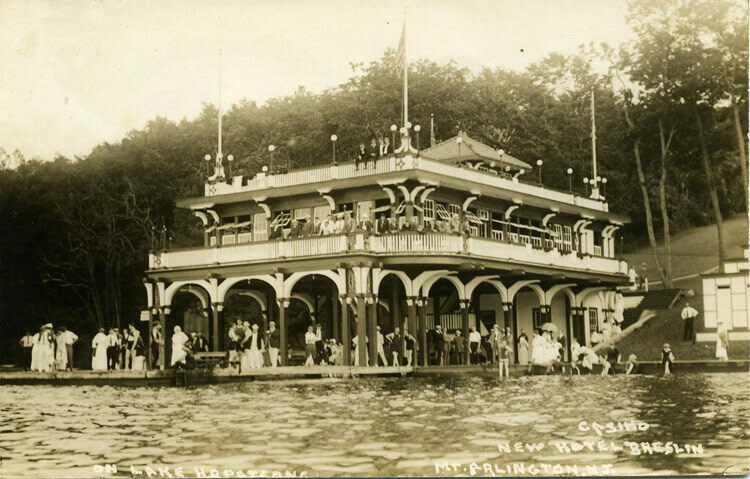 While started with great fanfare, the concept of such a large and exclusive private club on Lake Hopatcong did not prove financially viable and after three seasons it was converted back to the Hotel Breslin. In 1910, the Hotel Breslin was further expanded and more than $100,000 worth of improvements were made. Every room now featured hot and cold water as well as electricity – amenities only found at the plushest hotels of the era. 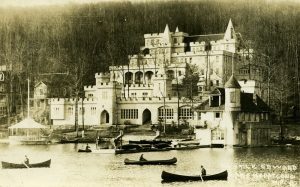 A new “casino” (a term used at the time to indicate a large public space) was added in the form of a massive boathouse, as were an electric elevator, a grill, a children’s dining room, and a garage. In addition, a new 20-passenger vehicle met all trains to transfer guests to the hotel. The Lake Hopatcong Breeze reported that the addition of a tango room in 1914 was very popular with the young people. In 1918 the hotel was sold to Mack Latz, owner of the Alamac Hotel on the ocean in Atlantic City. Latz renamed his new Lake Hopatcong property the Alamac and completed a major renovation, adding a sun parlor, new furnishings, tennis courts, an “Alamac Ark” for children, a bachelor lodge, miniature golf, and more. In 1923 Latz would erect another Alamac on Broadway and 71st Street in New York City as well as one on Collins Avenue in Miami Beach (both buildings survive to this day as apartments). Latz enjoyed hosting competitions which brought attention to the hotel. Swim championships featuring national competitors were a regular occurrence. A giant checker tournament, featuring life-size pieces and a large landscaped playing board in front of the hotel took place in 1922. The Alamac also hosted several major chess tournaments including the 1926 Pan-American Tournament won by world champion Jose Raul Casablanca. The mid-1920s saw Arthur Murray, the famous dance instructor, in charge of social events at Lake Hopatcong’s Alamac, which then featured a live orchestra, motion picture screenings, and a host of daily activities. In the late 1920s, the hotel was sold to the Jacobs family, who adopted a kosher menu and billed it as “Alamac in the Mountains.” It was during this time that the hotel became a favorite of a young Milton Berle, one of vaudeville’s newest headliners. Hit hard by the Depression, the hotel closed in the late 1930s. Reopening during World War II, it was used by individuals traveling to Picatinny Arsenal as well as others in the area. After the war, the hotel was in need of an overhaul but continued to host meetings such as the Morris County Officials Association in 1946. A new ownership team took over in 1947. 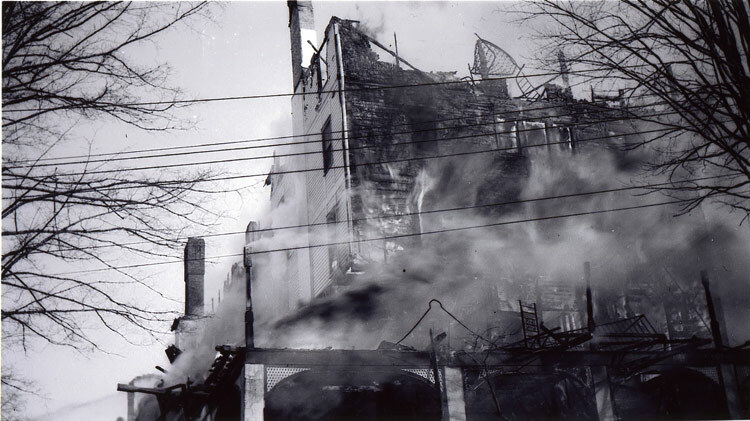 During renovations the following winter, the hotel caught fire and was completely destroyed on February 21, 1948. Today the remains of the Hotel Breslin’s exterior staircase and some of the features of its grounds can still be found among the residences now on the site. The hotel’s boathouse and a few outbuildings have survived, as have several of the grand residences that formed Breslin Park. During its existence the Breslin, and later the Alamac, blazed the trail as Lake Hopatcong became a major tourist destination and, symbolically, its destruction signified the lake’s decline as a hotel resort. 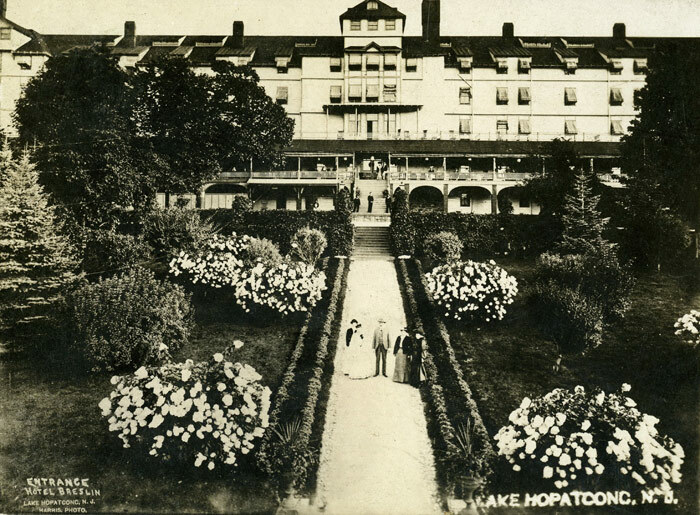 While some hotels would continue to operate in the decades that followed, Lake Hopatcong was evolving and its days as a grand resort were in its past.